The beautiful blueberry blossoms must have enticed the bees into good behavior this weekend. They were happy and cooperative and the hives were moved into the field without incident. Look at the beautiful even brood pattern on this frame; this shows the queen has been busy laying eggs. The brood will soon hatch and this queen's colony will grow even larger. The colours in the blueberry field are soothing and peaceful: greens, dark reds and the pink-white of the blossoms. The bees could not help but be content with such an idyllic quilt covering their landscape. Here you can see DH pointing out the queen in one of the hives; she is the large blond just to the right of the hive tool. The drone attendants follow her everywhere. I wonder if this queen tires of all the attention she gets from the paparazzi? With the cover removed from the hive, you can see workers returning back with their booty. The pollen sacs on their legs are swollen huge; the yellow is no doubt from the many dandelions growing in the nearby field but you can also see several with bright orange sacs. Haven't they been busy? The ends of the wooden frames are stained yellow with the pollen on sunny days. Last weekend we began moving hives into the blueberry fields, as the blossoms are now open. We will move the last of them early tomorrow morning. Rain is predicted which is good for moving day, as that means all the bees are home when the hives are moved and no one gets left behind. After that, we hope for sun! Hot off the press, a new pattern is being added to the Sew Karen-ly Created...pattern line. Made with Michael Miller Fairy Frost, Sunshine & Lollipops looks like a day in the park. This very easy to sew design uses only one template; the lollipops are appliquéd to the background. Finished size is 51-1/2" x 59-1/4". The pattern retails for $10.95 and will be added to the checkout page of my website shortly. In the meantime, if you'd like to order a copy please email and I can send you an online link to pay by credit card. Every year for the past 10 years or so, I have participated in the annual Trend Tex Challenge through The Canadian Quilter’s Association. This challenge is a fund-raiser, with all quilts being donated to an auction in support of CQA. This will be held during Quilt Canada in Saskatoon, May 25 - 30, 2009. Each participant purchases the same 5 Fat Quarters of fabric and is asked to interpret the same theme. In past years, themes have been such things as “Celebrate”, “Quilting From The Edge”, and “Time”. (If you scroll back through my posts, you can see my last year’s entry for “Quilting From The Edge”) This year the theme is “Roots”. Originally, I decided that I would portray “square roots” and had great fun imaging how these would be expressed in patchwork, and drafted out several interlocking block variations in my head. When the fabric arrived last fall I set it aside, figuring I knew exactly what I was going to make. However, when the time came to sew the fabric, it just wasn’t amenable to anything so mathematical. Instead, it cried out to be something wild and crazy. Blame it on a weak batch of Miss Clairol Nice ‘N Easy if you will, but my piece suddenly took on a life of its own and morphed itself into saying “My Roots Are Showing”. It isn’t difficult for me to determine the tuber of my own quilting; as a Maritimer, my roots are historically and firmly planted in patchwork. I began with a sketch on freezer paper. I was determined to use only the 5 Fat Quarters so I needed to make sure the bias binding for the circular outer edge was made first. For this I chose the stripe and cut my binding strips 2-1/4" wide. The wildest piece would be my background, and the binding picked up the colours in it very nicely. I traced my appliqué pieces onto fusible web. With only 5 prints, I needed to get creative to add variety to the patchwork, so I used the wrong side of the orange to give a softer shade for skintone. The orange was used again, right side up, for the lips. The white teeth were cut from a selvedge edge on one of the fabrics. When the hair tentacles were laid in place, they were lost in the busy background. I decided to use some of the plain blue underneath to add definition. The blocks were sewn together, and then cut to shape for the hair. At this point, the piece is mega busy…too much going on. When I added the outer blocks, it got worse. My solution was to turn the background piece to the wrong side, as I had done to soften the orange face. 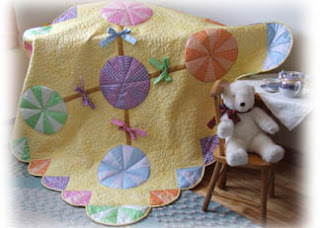 The blocks shown circling the perimeter of the quilt represent some of the myriad of techniques used in quilting: trapunto, satin stitch appliqué, blind stitch appliqué, raw edge appliqué, hand appliqué, faced appliqué, selvedge edge patchwork, embroidery, embellishments, ragwork, yo-yo’s, crazy quilting, foundation piecing, and strip-piecing. Each block uses a different technique. An extra layer of batting was applied for trapunto under the face. The excess was removed with scissors. Then I layered the quilt, pin basted and began machine quilting. I really like the dimension achieved in the quilting from the extra layer of batting. For me, quilting is as firmly rooted in the patchwork tradition of the past as are Hairiet’s wild tresses in log cabin blocks. For those of you who will be in attendance at Quilt Canada, please check out the Quilter's Haven booth in the vendor's mall. They will have a selection of my patterns as well as Canadian Heritage Quilting. Take a visit to The Quilters Net blog to check out some pictures from the weekend launch. For those of us who missed this event, it's great to see that Bev is planning to do it all over again next year. Here's the first picture in from the Maritime Beauty workshop in Keswick Ridge a couple of weeks ago. Gail has done a very colourful, scrappy version which looks terrific. Its always fun to see the design sewn in different palettes and styles, and the personal stamp each quilter puts on her creation. This week I finished up a 1/25th scale miniature quilt, packaged patterns, and began work on samples for the fall workshop on Log Cabin Diamonds (details and pictures to follow). Hubby and I spent yesterday doing bee work; there's much to do this time of year getting the hives ready for their busy work season ahead.